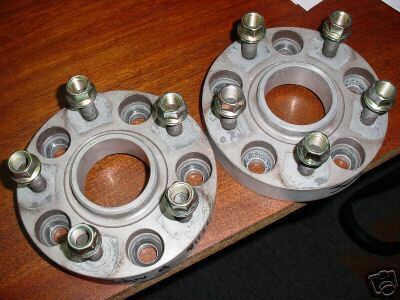 With the spacers with the bolts on them, what about the original bolts, what happens with them? They don't get hung up on anything? IM0000 are your spacers the kind with their own bolts? send me a pm please. This is what they look like. The open nuts thread onto the hub studs, and the wheel fits as normal over the studs pressed into the spacer. Search ebay, etc. Watch the price however - if you play your cards right, sometimes a good set of 7.5 & 9x17 OEM Porsche wheels can be had for not a lot more, and no spacer required. Garth thanks, it's very clear now. I have brand new Goodyear F1 tires on my car, and I also really like the phone dial wheels. I have a '79 with 16 inch phone dials. For $106 total to my door I got 22mm spacers that bolt right up, nothing extra needed from [email protected]. i think in one way they bolt into the hub beneath, but have also bolts on the spacer to hook onto the wheels. making it a bit heavier but more rigit, in order to have less of a migraine trying to fit it all.